In 1985, Sukey and John Jamison started a farm business with two mortgages, three kids, and no job. They started raising lambs on grass, developed a mail order business, got discovered by many of the chefs who were fueling the Food Revolution, bought a USDA meat plant, and somehow educated their three kids whom they hoped would support them in their golden years. Sukey and John relate how they dodged the bullets of under-capitalization, learned how to farm sustainably, and made Jamison Farm Lamb a staple on the menus of the best restaurants in the country. 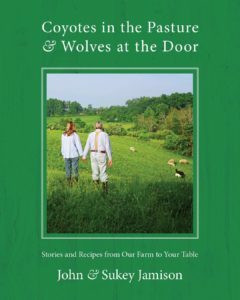 Coyotes in the Pasture and Wolves at the Door includes photos and Sukey’s own recipes.